Acute tubular necrosis in the allograft. 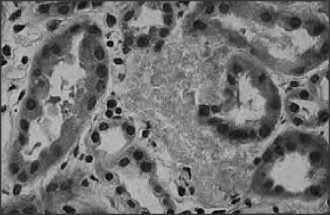 Unlike "acute tubule necrosis" in native kidney, in this condition actual necrosis appears in the transplanted kidney but in a very small proportion of tubules, often less than one in 300 tubule cross sections. 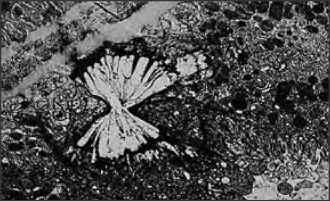 Where the necrosis does occur it tends to affect the entire tubule cross section, as in the center of this field . 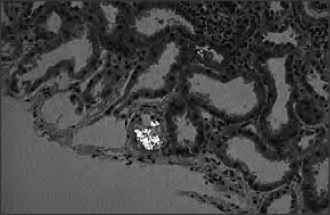 A completely necrotic tubule in the center of the picture in a case of acute tubular necrosis (ATN) in an allograft. 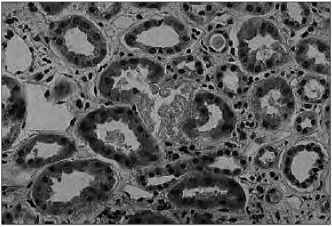 The tubule is difficult to identify because, in contrast to the appearance in native kidney ATN, no residual tubular cells survive; the epithelium is 100% necrotic. Calcium oxalate crystals seen under polarized light. These are very characteristic of transplant acute tubular necrosis (ATN), probably because they relate to some degree to the duration of uremia, which is often much longer in transplant ATN (counting the period of uremia before transplantation) than in native ATN. With prolonged uremia elevation of plasma oxalate is greater and more persistent and consequently tissue deposition is greater .